HRBSE-104 | Size: 100 ml / 3.38 fl. oz. Hydrates, heals and firms offering a beautiful balanced skin. For normal and mixed skin. Counters fine wrinkles, color imperfections or irritations. Visible effects may appear after about 1 week of treatment: the skin shows a glowing radiance, an improved texture, the imperfections are being reduced. INGREDIENTS: AQUA, GLYCERIN, HELIX ASPERSA SECRETION/POLYHELIXAN, DICAPRYLYL CARBONATE, GLYCERYL STEARATE, CETEARETH-20, CETEARETH-12, CETEARYL ALCOHOL, CETYL PALMITATE, SIMMONDSIA CHINENSIS, CETYL ALCOHOL, PARFUM, BENZYL SALICYLATE, SODIUM BENZOATE, POTASSIUM SORBATE, PHENOXYETHANOL, ETHYLHEXYLGLYCERIN, ALLANTOIN, BUTYLPHENYL METHYLPROPIONAL, CITRONELLOL, LINALOOL, HYDROXYCITRONELLAL, HYDROXYISOHEXYL 3-CYCLOHEXENE CARBOXALDEHYDE, LIMONENE, ALPHA-ISOMETHYL IONONE, BENZYL BENZOATE, HEXYL CINNAMAL, TOCOPHEROL, EDTA. 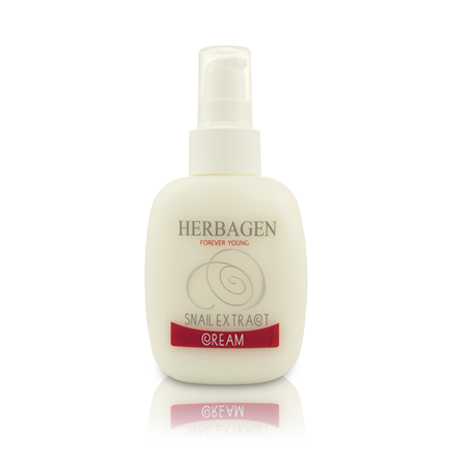 I purchased this product to accompany the Snail Extract Repair Serum. It has a slightly thicker consistency, but absorbs quickly and smells great. It's a good moisturizer! Fabulous product!! I use it day and night and I will definetely recommend it to all my friens.Thank you so much for your useful help.